Like a weekday commuter leaving his driveway on a weekend who finds himself on the road leading to his office instead of the road to the grocery store he was sent out to, I found myself in the Psalter this morning – on auto-pilot – just one day after deciding not to begin my time with the Word at the Psalter. 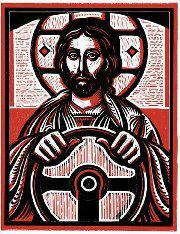 So accustomed am I to this discipline that not until I was well through my daily commute of the lectionary did I realize not only that I had made the wrong turn, but also and most significantly, that I am not driving – He is, God, Jesus, Spirit – God my co-pilot, auto-pilot, whatever you want to call Him. God has the wheel. Kingship. Not marriage. And yet this psalm has so often been used as one of the references for the bridal paradigm describing Jesus, the church, vows and covenants thus mixing up, at least in my mind, meanings and metaphors about love and marriage. Scripture can be so twisted and mixed up, it seems to me – used, abused and misused to support particular metaphors and paradigms for love, for God. For the past few months I have been searching Scripture for God’s thoughts and revelations on love and marriage, generally, and specifically on the type of romantic, heart-connect love between two people that leads to a marriage, Christian or otherwise. I have been looking into this as I assist a family member in selecting both biblical and secular readings and reviewing the liturgy for their upcoming wedding. And as I’ve researched I have found very little in Scripture that speaks to the kind of love most of us today would consider essential for bringing together two people in marriage. The romantic-heart connect-equally yoked-in this together – two whole people joining (not two halves making a whole) – type of love is the expectation and norm, today. You don’t have this, you don’t have a marriage. But in biblical times and thus woven into all the doctrines, liturgies, and laws this type of love was not just not the norm, but also not the point. I have no more to offer today other than I’m grateful God is at the wheel and that I was redirected back to the Psalter despite my resolve to take a different road this morning. He has me back thinking and praying about what He knows I need to think and pray about. This entry was posted in Whispers and tagged God, letting go and letting god, psalter, scripture. Bookmark the permalink.